Picture this. A newborn lies in a bassinet, wrapped tightly in a hospital blanket, with a cute woolen skullcap covering the fuzz of hair on his head. Mom looks from her bed, exhausted from giving birth but glowing as she gazes at the angelic face of her child, pulling on the heartstrings of love that will never wear out. Dad looks at the baby and feels an immense sense of pride and achievement – that’s my boy (or girl) – and appreciation for his wife, but a thought comes unbidden into his mind that he tries desperately to dismiss. This tightly wrapped, little bouncing baby has the look, feel and contours of a football. He could (gently) cradle that baby in his arm and run to the end zone. Not that he ever would do it, or even remotely imagine that he should. But the image is there because dads think different. Mothers often think “what if?” Don’t ride the bike in the street, what if you fall into traffic? Don’t play on the stairs, what if you trip? But dads tend to live in the moment with their kids. Wow, look at him beat the car down the hill on his bike! What a lithe landing my little ballerina made after tripping down the stairs. Where moms sometimes see disaster, dads can assess potential. Such differences are caught in a familiar scene, when dad finally decides that baby is big enough to toss in the air with a full release and catch. Deep in his psyche, he’s been waiting for this moment ever since he suppressed the thought of his baby as a football. He contained himself for a year as the little guy grew, lifting him gently, spinning him slowly in circles with both hands while supporting the head, and maybe even daring to hold the baby above his own head. But all carefully choreographed caution is thrown to the wind as the 1-year-old makes his first tentative run across the room into dad’s hands. A long-dormant instinct kicks in as dad feels the rush and wonder of holding his amazing, one-of-a-kind child who just abandoned himself with utter delight into his strong and able hands. 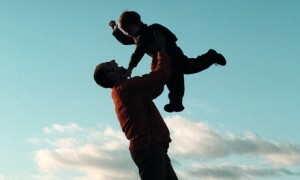 In one motion that has been repeated since the dawn of humanity, dad clasps the toddler, propels him smoothly above his head and — yes — releases. Up, up, in total freedom and free-fall, the child hangs aloft and begins his descent. There is dad, totally engaged and focused, his hands poised to catch this little bundle from its heavenly orbit. There is the child, with a slight look of terror in the eyes, but with the widest smile and most incredibly giddy laughter that may ever stir from his or her soul. And there is mom, caught off guard, ready to reach out yet not sure whether to grab the child before clobbering her husband. Dad catches and draws his precious offspring to his chest, and the child yells, “Again!” But dad knows that the paternal moment has passed as he hands the child into his wife’s arms. There will be other moments, and if he doesn’t drop the child in the next year or so, mom may actually come to enjoy the traditional child toss. Dad does this not to be dangerous or drive his wife to the edge. Consciously or not, dad has his own loving list of “what ifs” for the care and welfare of his child. What if his little one never learns to take a risk or face down fear? What if he never makes skid marks on the sidewalk or yells, “Look, mom, no hands!” What if his child never crosses the street alone or ventures deep into the woods to hear the silent stillness beneath the trees, where nature rests and God speaks? With my own two boys, I am aware that I must push them gently from home. A few times a year, we hike up a mountain where the trails are marked according to toughness. Last fall, we took the most challenging route, climbing at one point over bare rock while looking out for copperheads lurking in the crevices. On the way down, the younger boy ran along the graded path to show us that he wasn’t tired, and tripped on the gravel. The knee wound bled badly and I rinsed it with bottled water till we got home, where my wife washed it with disinfectant and applied a bandage. I could see that my son was torn between the rugged freedom of the path and the sterile safety of the home. A week later, as the wound started to lose the scab, I told him he would likely have a small scar. He looked worried until I showed him a scar on my foot which I got when I was about his age, doing something risky. He looked at my foot and at his scabby knee, and gave me a wink that said everything would be fine. In this shared moment he came to know that dads think different.